Yahoo's online music strategy has finally taken shape after a year of development with the launch of the Yahoo! 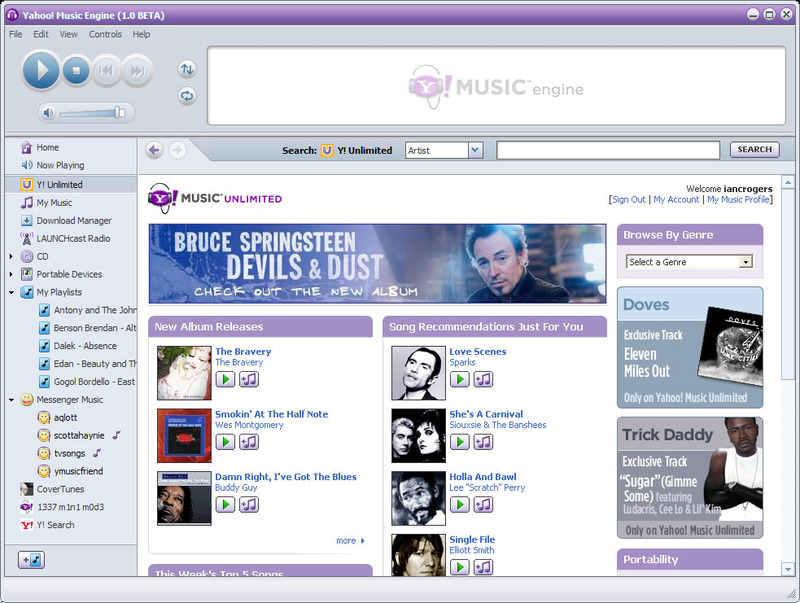 Music Engine, the company's challenger to iTunes and subscription services such as Napster. While it may be late to the party, Yahoo threatens to shake up the industry with prices 60 percent less than its rivals. At the center of the Yahoo! Music Engine lies Yahoo! Music Unlimited, a music download service powered by MusicNet. For a fee of $4.99 USD per month paid annually, or $6.99 USD monthly, customers can stream or download an unlimited number of songs and transfer them to portable devices supporting Microsoft's Janus digital rights management technology. By comparison, Napster and Real charge customers just under $15 for the same functionality. Yahoo is offering all of its tracks in 192Kbps Windows Media Audio format, from a growing catalog of over one million songs. The company says it is currently signing on more independent labels. As with any such music service, songs will become unplayable if the subscription lapses. Alternatively, users can purchase individuals songs they wish to keep indefinitely for 79 cents, or 99 cents for customers who forego the monthly fee. Downloads can be played on a total of five PCs or transferred to WMA-compatible portable devices. LAUNCHcast, Yahoo's online radio service, finds prominent placement in the company's new player as well. Yahoo! Music Unlimited Subscribers have full access to more than 150 pre-programmed, commercial-free channels. Yahoo! Music Engine also brings to the table a full-featured music player, but goes beyond playlists and CD ripping with an open architecture tailored to third party developers. The idea, company officials say, is to build a library of plug-ins that offer a range of extended functionality, such as music slideshows and podcasts. "As media players increasingly become a commodity, the services that are in them become more and more important. The challenge was to build not just a media player, but a container for media services with media player functionality," Ian C Rogers, Lead Engineer for Yahoo! Music Engine, told BetaNews. "Additionally, every component of our media player is built with our own plug-in API, so we know our framework works -- we use it!" While it may lack actual file sharing, Yahoo has built in some peer-to-peer support. The player ships with a plug-in that integrates Yahoo! Messenger buddies, enabling users to share music with their friends or simply browse another's playlist to discover new music. Community features are not limited to plug-ins, however. Yahoo! Music Unlimited attempts to differentiate itself from iTunes and other services by focusing on personalization. Users can setup profiles of their musical likes and dislikes, which are used by Yahoo to create custom home page of recommended artists and songs. "Yahoo! Music Unlimited's personalization leverages 3 billion ratings already made by Y! Music users to provide smarter recommendations, providing personalized new releases, just added, and song and artist recommendations based on your ratings," explained Rogers. "Also, a SmartShuffle improves shuffle play by biasing based on ratings, variety and recency of listen." Despite the overlap, Yahoo's recently acquired Musicmatch subscription services will remain operational for the time being; the company says it plans to eventually combine Musicmatch's offerings with Yahoo! Music Unlimited. Yahoo! Music Engine is being rolled out in beta form, which will give Yahoo a chance to ensure scalability before beginning a media blitz across its Web properties. The application runs on Windows XP and Windows 2000. Yahoo! Music Unlimited will initially be available only in the United States, but international support is expected to follow.